HQ Dental can provide many different options of acrylic denture. Our current options are listed below. Injection moulded dentures are available as an optional extra. 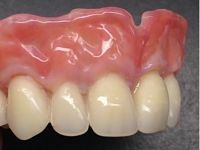 A high quality denture produced by senior technicians. Our prosthetic work is manufactured to incredibly high standards. We are happy to accommodate any personal preferences by substituting our range of teeth for those of your choice. If you would like to know more about our acrylic dentures, please do not hesitate to get in touch with one of our team today.